Why is Social Media and Digital Marketing Important? Approximately three-quarters of customers today will research a company online before making a purchase. More and more consumers are abandoning the traditional phone book because it doesn’t tell them anything about the company. With this in mind, a great online reputation is where many companies have the most impact with customers. Level of social media engagement, customer reviews and other aspects contribute to someone’s decision to make that initial purchase or phone call. Interacting with people who comment or follow your business also builds strong ties. People are more likely to trust a company that offers insight and communicates with them on a personal level, rather than one that constantly tries to sell to them. This leads to improved brand recognition and a richer customer experience which leads to customer loyalty. Social Media also gives you improved customer insights as you develop a personal relationship with your audience. Developing a regular social presence improves your placement in search engines when customers search for brands or products and helps drive traffic into your sales funnel. Studies have shown that social media has a 100% higher lead-to-close rate than outbound marketing, so building your social audience can significantly improve your conversion rate and funnel traffic to your business, website or online store. 84% of marketing companies found as little as 6 hours a week is enough to generate increased traffic – this includes generating content for multiple social channels, responding to customers and comments on social media, doing regular competitor comparisons and planning your social strategy in advance. Overall digital marketing is regarded as an essential item for running a business and will help bring you closer to your customers, improve your brand awareness and has a high potential to grow your business whether it be sales or services based. At Creative Warrior we have a great range of software to help track your metrics and the artistic skill to make your campaign original and stand out amongst your competitors. A Comprehensive Guideline to the Pros and Cons of Digital Marketing along with a comparison of the different platforms available. According to the 2011 Social Media Marketing Industry Report, 78% of marketers saw increased traffic with just six hours a week invested in social media. One of the reasons for this is that you can reach customers that traditional marketing misses. It can boost your reputation and build relationships by demonstrating your personality, being able to interact with customers and show them that you care. This is a great advantage if your business operates solely online like an online store. You can learn more about your target audience by studying visitor analytics which in turn helps with your other marketing campaigns so you can make them more relevant and it is also more cost effective than other marketing methods. It can be difficult to constantly come up with exciting content that interests your audience and without relevance your efforts could be wasted along with your valuable time. You must also be aware of public backlash and that anything that you post is up for grabs by your competitors. Within your working environment you also need to get your staff to adhere to internal social media policies so that they aren’t wasting time and productivity. Quality over quantity – don’t bombard your audience with frequent or repetitive information that over takes their news feed. Make your content relevant and limit your updates to a few times a week is a good place to start and judging on statistics you can increase exposure or modify the content to suit. So what type of content should you post? Try running contests or promotions, advertise your expertise with blogging content, highlight relevant industry news, showcase happy customers or business milestones and promote your new products. Have an emergency plan for negative comments. Don’t take bad feedback personally and maintain a professional level when responding to customers using social media otherwise it could prove terribly detrimental to your business image. Determine a goal for your social media. This could be to build awareness, to increase sales or for customer loyalty. 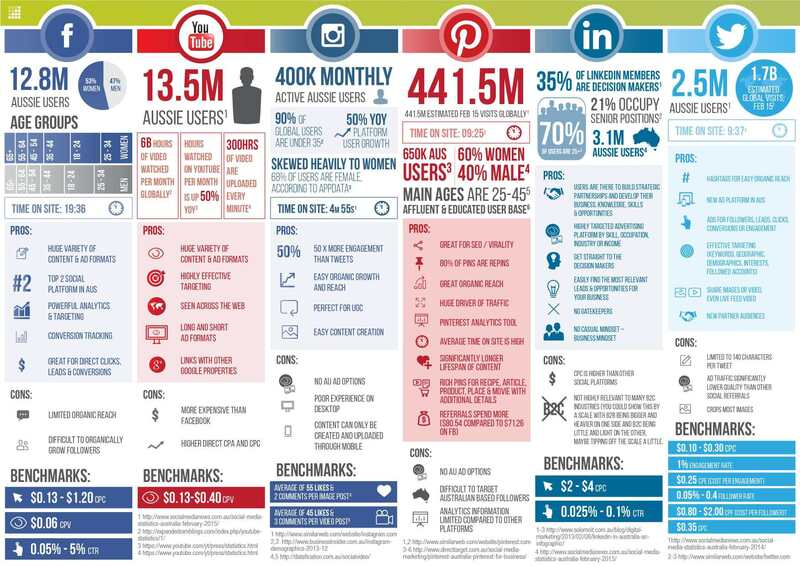 Identify which social media networks you want to focus on. Some will have more relevance than others depending on the type of your business. Look at what your competitors are doing and try and get an understanding of your target audience and how they use social media. 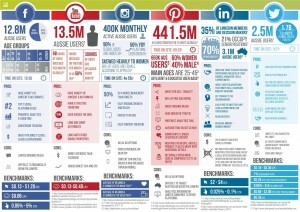 Below is a great info graphic of the 6 major players in the social media world and what you can expect from each. Click the image to view it in more detail. If your goal is awareness, you’ll want to measure growth, engagement, brand awareness, sharability, likes and subscribes. For loyalty, look at engagement, sentiment and influence.